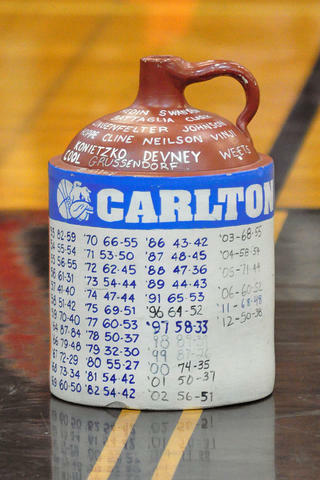 The Little Brown Jug rivalry between Carlton and Wrenshall dates back to 1951, but Tuesday nights matchup might have been the most exciting Little Brown Jug game to date. With 2.9 seconds remaining on the clock, the Bulldogs trailed 50-49, but that was before Carlton sophomore, Spencer Rousseau, pulled up from mid-court and nailed the shot as time expired to give the Bulldogs the 52-50 victory. The Bulldogs ended the first half on a 10-2 run to only be down 31-28 at the half. They came out and battled with the Wrens, outscoring them 24-19 in the second half to secure the win. There was no box score submitted for this game. With the win, the Bulldogs now hold a 45-24 advantage over the Wrenshall Wrens in the Little Brown Jug game. Carlton moves to 4-8 on the season with the win and snap a five game losing streak. They will be back in action on January 18th when they welcome the Barnum Bombers to town. The Wrens drop to 2-8 on the season and will look to get back on track when they travel to play the Two Harbors Agates on January 18th.